The stuntwoman who died in a motorcycle accident while filming Deadpool 2 has been identified as SJ Harris. 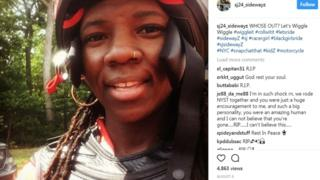 Ms Harris, who was reportedly the first licensed female African American road racer in the US, was killed on Monday morning in Vancouver, Canada. Eyewitnesses said she had lost control of the bike, jumped a kerb and crashed into a building. Deadpool 2 star Ryan Reynolds said he was "heartbroken, shocked and devastated" at her death. Production on the film has been temporarily halted. Local media say Ms Harris had successfully practised the stunt several times before the fatal accident. Ms Harris has previously been described as a pioneer encouraging more women and African Americans to enter professional road racing. Black Girls Ride Magazine said in 2015 that she was "leading the pack in more ways than one". "I am everything people never saw in this sport," Ms Harris told the magazine, adding that the high costs of road racing were a barrier, and most of her competitors were young, affluent white men. During her first race, she said: "I was alone for most of the day, scared and in tears. I had no-one to talk to, and I didn't know what I needed." "Sisters on the track are few and far in between. I want to show them that there's more for them to be exposed to. I want to get kids interested through experience." According to her online profile, Ms Harris had been racing professionally since 2012. Deadpool 2 was said to be her first film as a stunt performer. On the FAQ section of her website, Ms Harris said that when it came to crashing, she was "not quite scared, but it crosses my mind at times, but a racer can't let it stop us". She said that "everything takes time", and encouraged readers to "face your fears".